Although it was during the early 1990s when I first became interested in dinosaurs and dinosaur art, much of what was floating around back then had been produced decades prior. This only intensified when A Certain Movie came along, and everyone rushed out whatever dinosaur-festooned tat and half-hearted books they could to cash in. If a publisher happened to have the rights to some old dinosaur paintings from back in the ’70s then, well, that was easy money. As such, I had this weird impression that the Age of Dinosaurs consisted of a 160-million-year-long dustbowl, with only a scarce few tress and ferns scatted about to liven things up a bit. First published in 1977 (with this edition arriving in 1978), A natural history of Dinosaurs is very typical of this Dino Dustbowl approach to palaeoart, and it all starts (aptly) right on the dust jacket. Authored by Richard Moody (who, it must be said, did a decent job), A natural history of Dinosaurs is divided into two sections. The first contains the real scientific meat, outlining the evolution, ecology and environment of the dinosaurs, alongside just a wee bit on the history of palaeontology. Some illustrations are included, but they’re mostly diagrams and simple monochrome line drawings. Naturally, what we’re really interested in is the book’s second section, which profiles 40 or so dinosaurs (and dinosaur-adjacent archosaurs) with wonderful full-colour illustrations. These are by various artists, all of whom are credited (hooray! ), including Michael Youens, who happened to illustrate the cover. Speaking of the cover, it’s striking enough, featuring a rather Burianesque tyrannosaur apparently preparing to stamp down on what’s presumably a juvenile Triceratops, although it’s a little badly proportioned. It may well strongly resemble Burian’s Tyrannosaurus and Gorgosaurus paintings, but it’s significant that this beast has one of its feet high in the air (kicking up some of that dust) and looks very active in spite of its size. In fact, the back of the jacket even features a tyrannosaur walking along with a fully post-Renaissance, horizontal posture. By this time, the wacky ideas of Ostrom, Bakker and co. had really reached the mainstream. There’s still plenty of straightforwardly retro stuff on offer here, of course. This illustration of Allosaurus is again by Michael Youens, and once more shows his penchant for depicting juveniles as miniature versions of the adults. Other than that, these allosaurs aren’t too bad for the time – they have a certain Zallingerian tubbiness about them, but at least there’s a hint of the horns on the skull, and they have heads, necks and shoulders that are distinct body parts. Naturally, there’s one individual in the middle posed exactly like the famous AMNH mount, and Knight/Zallinger/Caselli/etc.’s restoration of the same; that was just obligatory back then. It’s one cliché that does seem to have died out these days, mind. Perhaps someone could resurrect it in some interesting way. Now there’s a challenge for ya. As far as clichés go, Archaeopteryx being grabbed by some other theropod is one of the most notorious of all, being replicated again and again over the years; in The Palaeoartist’s Handbook, Mark uses it as the archetypal example of a palaeoart meme. Here’s Tony Morris’ version, starring Compsognathus in the role of bird-grabber. I like this illustration very much for its unusually lush and quite delightfully impressionistic vegetation, and not so much for its Archaeopteryx with nonsense fingers. It’s perhaps notable that Compsognathus is depicted, correctly, with a three-fingered hand…and no flippers. Back to the dustbowl, and oh boy, it’s Megalosaurus. Strangely, this illustration is dominated by an Iguanodon with its legs splayed at a rather worrying angle, which makes me wonder if this is actually a detail from a larger piece. In any case, artist Ann Baum has definitely channeled Neave Parker in her depiction of Megalosaurus as a hump-backed beast with weird, withered, five-fingered hands. Now, some theropods did have hands a bit like that, but certainly not the tetanuran Megalosaurus, which makes me wonder where that old meme came from (other than Parker’s imagination). This Megalosaurus also has a head that’s all zipper teeth and angry eyes and a lower jaw that tapers to nothing. I love it. Now here’s something you wouldn’t see in a proper old-school dinosaur book – Deinonychus! And leaping athletically up into the air, to boot. Even given oddities like the tooth row extending waaayy back under the orbit (inspiration for Blue in Jurassic World? ), this Bakkerian beastie is rather good for the time. This is another Michael Youens piece, and here he does demonstrate that he knows his way around a pretty, painterly sky, even if that vegetation is still looking rather sparse. …this very odd illustration of Velociraptor (and Protoceratops), by Thomas Crosby-Smith. In contrast to Youens’ dynamically posed animals, the two theropods here are sluggish, static and highly reptilian-looking, with long, dragging tails and a distinct lack of many of their most famous features – not least their sickle claws. In fact, not only do they lack sickle claws, their first toes are also missing for some reason. Moody makes it clear that the interaction between Protoceratops and Velociraptor is an allusion to the ‘Fighting Dinosaurs’, while also speculating that Velociraptor may have preyed on Protoceratops babies, hence the nest-raiding individual in the foreground. However, the Velociraptor in the background doesn’t appear to be fighting the Protoceratops so much as giving it a gentle frill-massage; the beaky one even appears to have a contented smile on its face. It’s weird stuff. Still, the plants and backdrop are rather pretty. While the usual Zallinger and Burian nods are present in this book, it also came hot on the heels of The Evolution and Ecology of the Dinosaurs, and a number of the illustrations are clearly influenced by Giovanni Caselli’s work in that book. Among them is this conspicuously big-eyed Spinosaurus, painted by Tony Morris. Firstly: I really like the sky, and the speckled, scaly texture n the Spinosaurus in the foreground. That’s lovely, that is. Secondly, this is a very typical and not-all-that unreasonable reconstruction of Spinosaurus for the time, overly-large eyes excepted. I do wish more people had drawn it standing fully upright, rather than crouching while warming up with its ‘skin radiator’, but there we go. Nowadays, we’re just doomed to see reconstructions of it swimming ‘cos no one wants to accept or deny that the legs were that short (with a few exceptions). 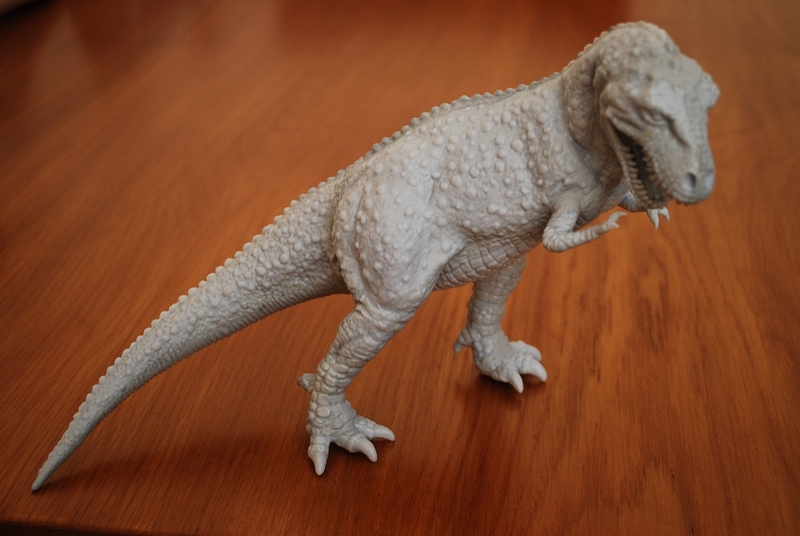 And finally…Ann Baum’s Rexy, a big, knobbly lump with blood-soaked jaws and more than a hint of Airfix. The skin textures are impressive, and hey, we get the idea; this creature appears suitably enormous and imposing, if a little ungainly. Having Rexy just standing there over a carcass does seem like a bit of a missed opportunity, though. Elsewhere in this book, tyrannosaurs are depicted trying to stamp on ceratopsians and flip over ankylosaurs (more on which next time) – why not portray Rexy in a more exciting scene? One might suppose that this is an allusion to the ‘scavenger hypothesis’, but Moody’s no 1980s Dougal Dixon, and the idea isn’t even entertained. Never mind. It’s a serviceable piece, and most importantly, it’s full of lots of lovely TREES that don’t look at all like they belong in a desert. Result! That Rex is obviously Godzilla, who was still I’m theaters in the late 70s. Deinonychus in children’s books from that period is always such a “well here’s an active dinosaur” on-off illustrations. The poor thing is almost always posed with its feet and claws fully extended, ninja-like, towards their target. It really does amaze me that nobody noticed the similarities between deinonychosaur sickle-claws and modern predatory birds’ sickle claws until, good lord, 2011. Or at least, nobody PUBLISHED on that similarity until 2011. Ooh, lovely memories! Thanks Marc! You deliver as many lardosaurs and waterlogged sauropods as us nostalgics, (many of whom are also sporting lard and wrinkles) can drool over, I had this book many moons ago and loved Youens’ stuff particularly. The colours are particularly striking. Poor old Deinonychus looks as if it is frozen in mid leap however. That slicing with the claws thing looks quite difficult and I wonder if that’s what dromaeosaurs actually did. Well done again, Sir! I’m sure the background mountains in the weird Velociraptor and Protoceratops are copied from a Renaissance painting. Everything up to the rather sparse tree looks very familiar.